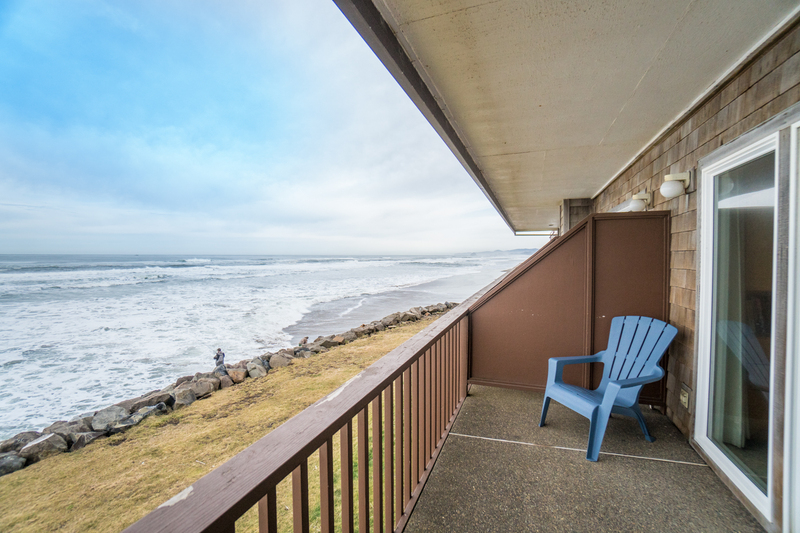 Pacific Sands Resort #18 is located in the charming town of Neskowin. 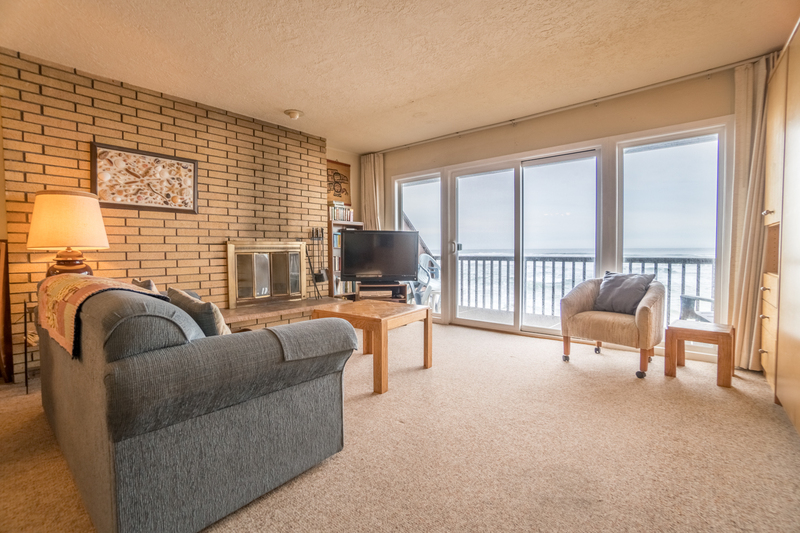 This Pacific Sands Resort Condo has dynamic oceanfront views! The condo is on the second level with a full kitchen, two tub and shower combination bathrooms, and one private bedroom with room for four guests. 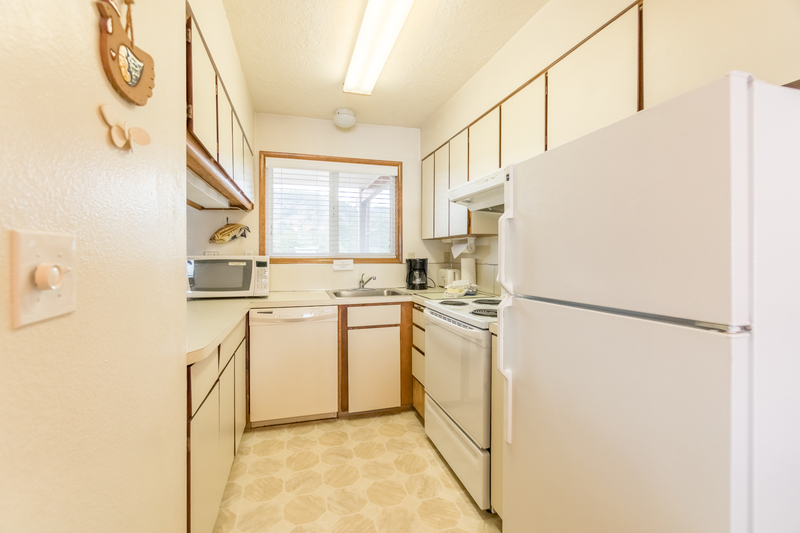 The kitchen has all you need to cook and serve any vacation or holiday meal. 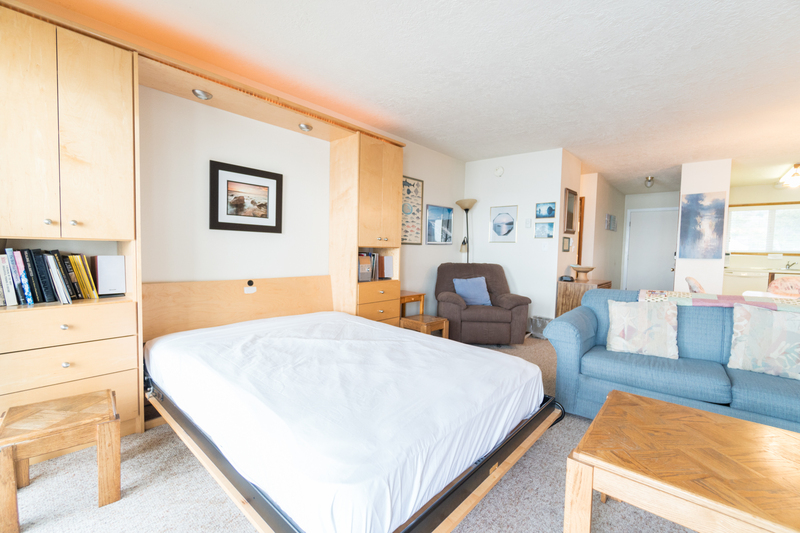 The bedroom has a queen bed, a small TV and an oceanfront deck. The living room has a new, high quality queen Murphy bed for two and a sofa sleeper that is comfortable for the kids. For added entertainment, the condo has a TV in the living room with Direct TV and Wi-Fi! When staying at Pacific Sands Resort #18, you'll have access to miles of sandy beaches from the property and be able to explore the ancient tree stumps when the tide permits. 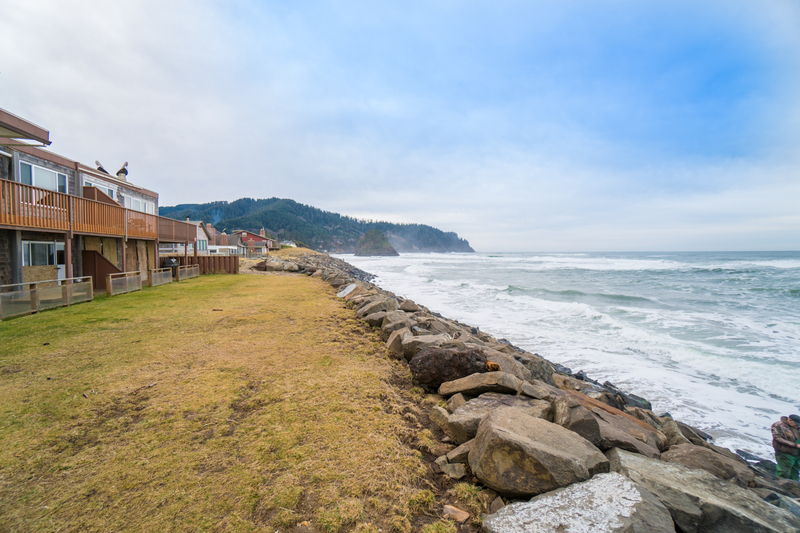 Why not take a stroll through quiet and quaint Neskowin to enjoy a round of golf, the tasty food at Hawk Creek Cafe or browse through the selections at the Neskowin Store. 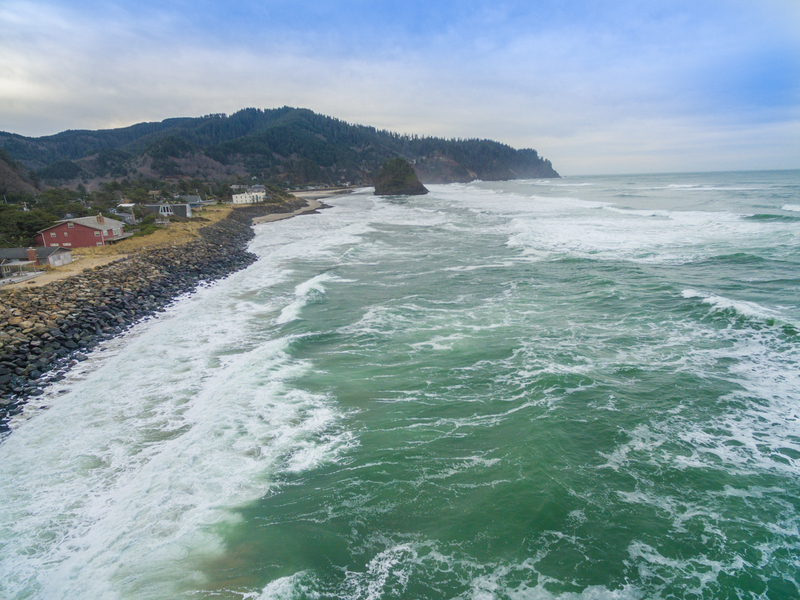 It is a quick and easy drive into Pacific City, north of Neskowin, or you can drive south to Lincoln City where you'll find more shopping and area attractions. A washer and dryer are not available at this condo, but feel free to use the local laundry mat located at the Neskowin Store if the need arises. 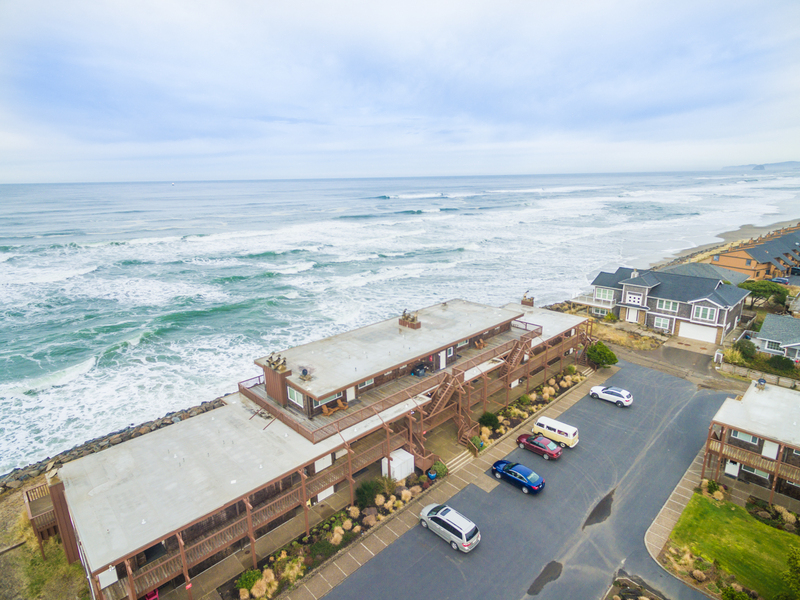 Come enjoy Pacific Sands Resort #18 with your family and friends today on the Oregon coast! Beach Access: Walking north from the unit on Breakers Ave to Sheridan Ave turn left to the sand. Parking is available for up to 1 vehicle at this home. Please note that boats, trailers, and RVs are unfortunately not permitted. This home is not pet friendly so please leave your pets at home, or make other arrangements for them. It is also important to note that during winter storms, the oceanfront windows and patio door may be partially to fully boarded up to prevent damage from possible sneaker waves. All Pacific Sands units are non-smoking and that includes balconies. "We loved this little condo! The pictures give you an accurate glimpse into what it looks like. We felt that we had everything we needed. The ocean crashes into the seawall almost right below the balcony and it is a very unique experience... powerful & relaxing. We'd love to come back." "Hello Stephanie, Thank you for your review. 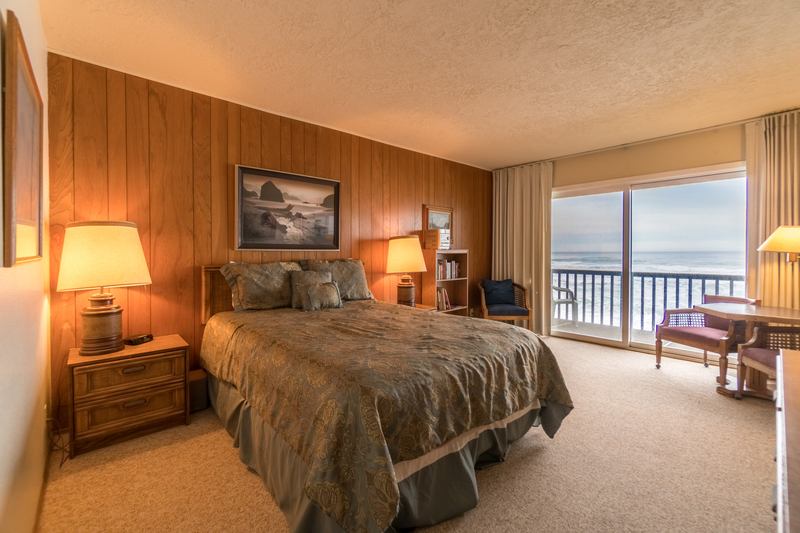 We are happy to hear that you enjoyed your stay at Pacific Sands Resort #18. We hope to see you back again soon on the Oregon coast!" "My wife and I have stayed in this particular unit many times, over the years, so there must be a good reason. Actually, there are many, and we are already looking forward to our next visit." "Hello Larry, Thank you for your review. We are glad to see that you enjoyed your stay at Pacific Sands Resort #18. We are looking forward to seeing you and your wife again soon on the Oregon coast! Thank you again for your review." 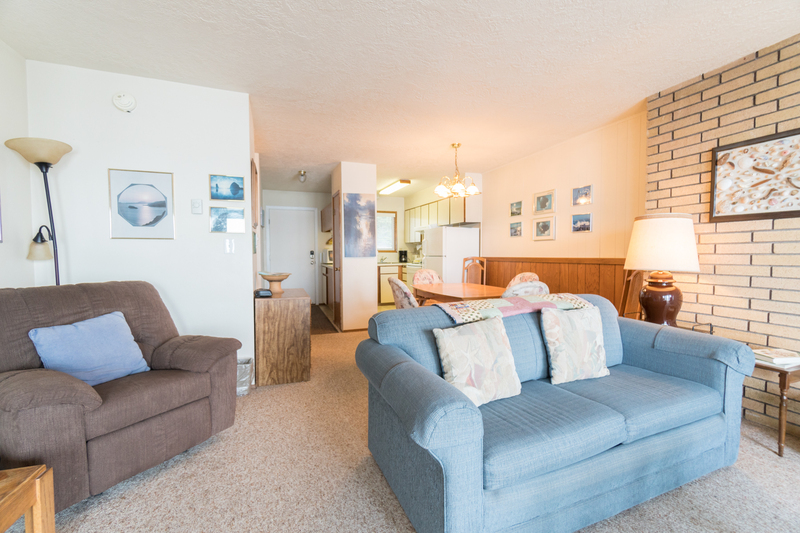 "This was our fifth time at Pacific Sands, our second in this unit. We love Neskowin and feel it's a nice, central location for everything we like to do. The pro's for this condo: Comfortable bed, spacious bedroom area, two bathrooms, fantastic view, double balconies, wifi worked fairly well, kitchen fairly well equipped for a rental. The dining set was nice sized, but we rarely eat at the condo. We also found the book selection to be eclectic and fun.Cons: plumbing really needs updated. No garbage disposal and both toilets had to be repeatedly flushed to empty. The living room furniture; the recliner is nice but everything else is uncomfortable. Again, even though it is dated, it was very clean. The exterior of the building is well maintained and the balconies are nice and sturdy. We did have an issue with dogs this time. There were several surrounding units with dogs that barked continually throughout the day, although we fortunately were never woken up by it. I also didn't see any owner cleaning up after their dogs in the back grassy area, which would have been really annoying if we'd been on the ground level. Overall you can't beat the price and location of these condos. We had a very, very hard time leaving this time, even looking into seeing if there were any for sale! We will definitely be back." "Hello Julie, Thank you for your review. We are happy to hear that you enjoyed your stay at Pacific Sands Resort #18. We can't wait to see you again soon on the Oregon coast! As for the issues you mentioned, the toilets have since been repaired and fixed. Thank you for bringing this to our attention. Thank you again for your review!" "It is one thing to hope that the facility meets the description, but #18 at Pacific Sands far exceeds that. Extremely clean, amenities galore, fabulous locations, private, excellent parking, close to restaurants, scenic sites, and activities. We plan to make our stay the first of many to follow!" "Hello John, Thank you for your review. We are so pleased to hear that you loved your stay at Pacific Sands Resort #18! We can't wait to host you again soon on the Oregon coast! Thank you again for your review!" "This was a great find and we loved our stay." "Hello Kathryn, Thank you for your review. We are glad to hear that you enjoyed your stay at Pacific Sands Resort #18! We hope that you loved your stay so much you'll be back again soon on the Oregon coast! Thank you again for your review." Enjoy the ocean in style! "We loved the format of the room. The living room has a great view of the ocean. It was plenty big. The bedroom also had a great view. We even invited my daughter and her family to join us for a night. They slept in a comfortable bed in the living room and we had more than enough room. " "Hello Bob, Thank you for your review. We are glad to hear that you had an enjoyable stay at Pacific Sands Resort #18. It sounds like you had a great time during your trip. We hope to have you stay with us again soon on the Oregon coast!" "I have now stayed at this particular unit twice and have been very happy with it each time. It's very comfortable and relaxing." "Hello Mike, Thank you for your review. We are glad to hear that you enjoyed your stay at Pacific Sands Resort #18. We hope to see you again for a third stay!" "This was our second stay in #18, and our next visit is already reserved. This has come to feel like our home on the ocean. Love the place, love the small town of Neskowin." "Hello Amory, Thank you for your review. We are glad to hear that you enjoyed another stay at Pacific Sands Resort #18. We can't wait to have you back soon for a third visit!" Found our new go-to for quick coast visits! 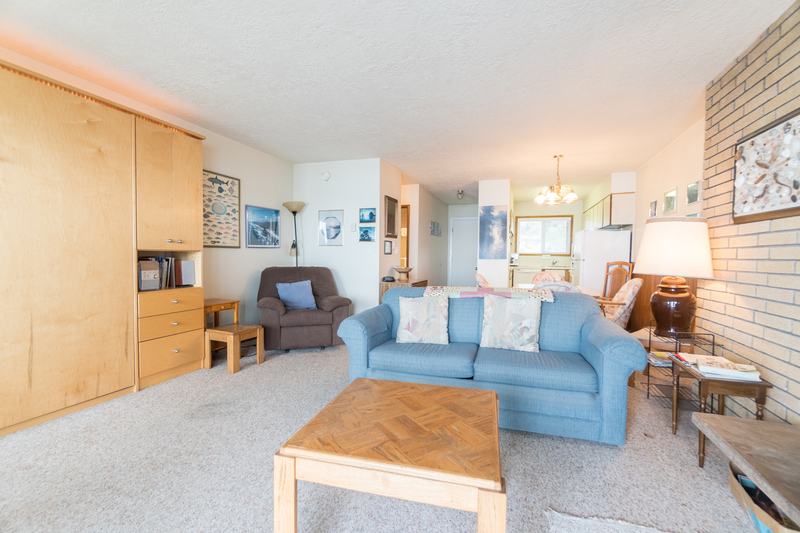 "Clean and well-equipped time capsule condo right on the beach. Loved the real fireplace and radiant ceiling heat. We saw a bunch of whales and seals. Bed and Murphy bed are very soft. Sofa is uncomfortable. Bring a hair dryer (or embrace beach wavy hair!) Vent fans in bath do not work. Other than those small issues, this place is perfect for a quick coast visit to wonderful Neskowin. Well be back!" "Hello Terri, Thank you for your review. We are glad to see that you enjoyed your stay at Pacific Sands Resort #18. We have put in a work order to have the vent fans fixed. Thank you for bringing this to our attention. We can't wait to have you stay with us again soon on the Oregon coast." "I was looking for a place to just relax and watch the ocean, read, and generally have a quiet few days, this place fit the bill perfectly. You almost feel like you are right on the beach." "Hello Mr. Krejci, Thank you for taking time to send in your review of your recent visit to Pacific Sands Resort # 18. We are quite pleased to hear you enjoyed this unit and the spectacular view the property has to offer. Happy Holidays ~ Oregon Beach Vacations "
"It was a great vacation, the place was awesome. I would recommend it to anyone. I will be staying there again. Thank you so much." "Hello Randolph, Thank you for your review. We are glad to hear that you enjoyed your stay at Pacific Sands Resort #18. We look forward to having you stay with us again!" "Very clean, private and easy checkin in and out. Highly recommended!!" "Hello Tyler, Thank you for your review. We are glad to see that you enjoyed your stay at Pacific Sands Resort #18! We hope to see you back again soon on the Oregon coast! Thank you again for your review." 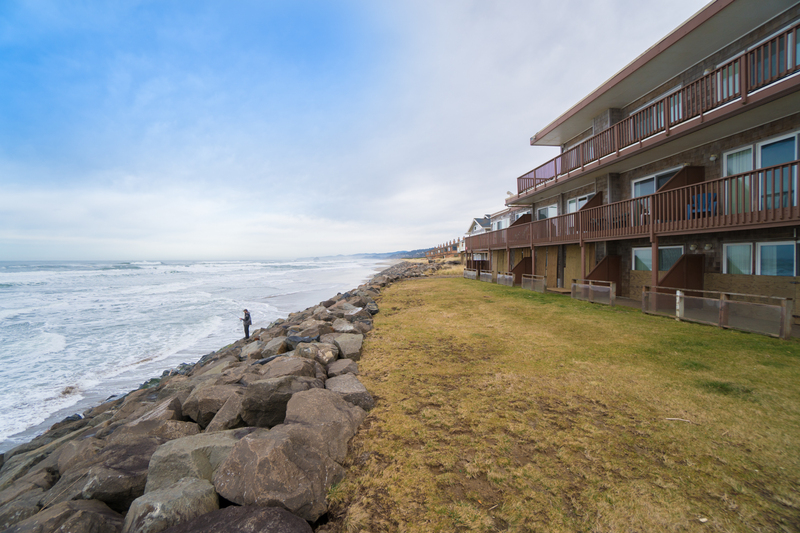 "I have traveled the Oregon Coast for many years, and was delighted to find this hidden gem of a town, Neskowin. The beach was awesome but the neighborhood was such a delight to walk through to get to our condo. Once we arrived we never got in the car again until we left. " "Hello Shelley, Thank you for your review. We are so happy to hear that you loved your stay at Pacific Sands Resort #18! We hope this means that you'll be back again soon on the Oregon coast!" My husband and I love this place! "My husband and I love this place! We've enjoyed the cozy, casual, comfort and incredible view of #18 at Pacific Sands for 20 years. 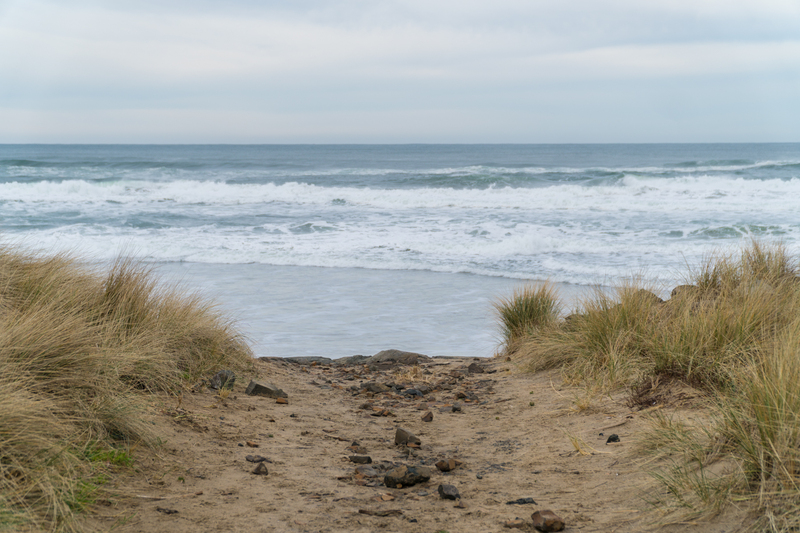 The little village of Neskowin is fun to explore, walks on the uncrowded beach are refreshing, and hikes on nearby forest trails exhilarating. At the end of the day we return to #18 for a pleasant evening, reading a book, listening to the waves, and watching the fire flicker. What more could you ask for? " "We spent the three days before Thanksgiving at the condo, so it was very quiet--hardly anyone else around. It rained and was stormy most of the time, so we enjoyed watching the waves as they came up to the rip-rap. We especially liked that the condo had ocean-view windows plus doors to balconys in both the living room and the bedroom. Both rooms were quite spacious, much larger than most hotel/motel rooms would be. We also appreciated the two baths. Everything was very clean and the furnishings were quite adequate for our stay--not new but in good shape. There were even some books to keep us occupied as we also watched the waves. We enjoyed a pizza from the store one night, and the next night brought back some takeout from Hawk Cafe; both were quite good." 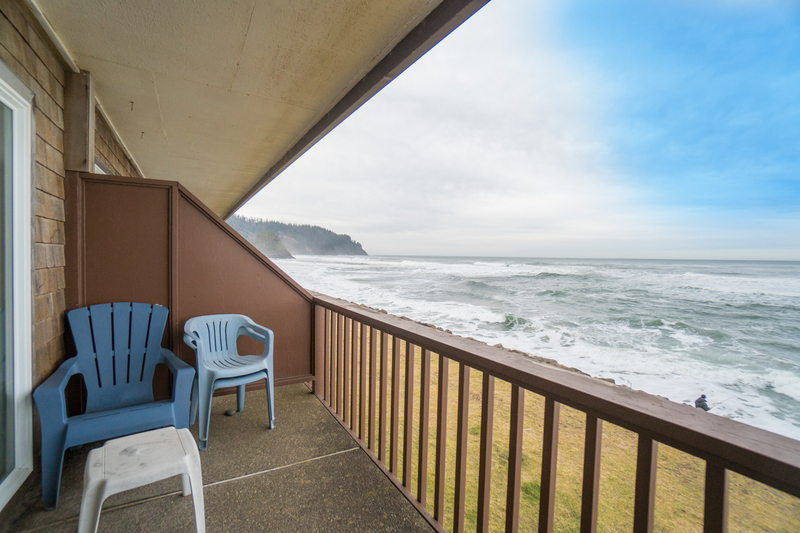 "Our condo on the Pacific Coast at Neskowin was perfect. The accommodations were clean and comfortable. And the view of the ocean was fantastic. We really hated to leave. " "Hello Laurie, Thank you for your review. 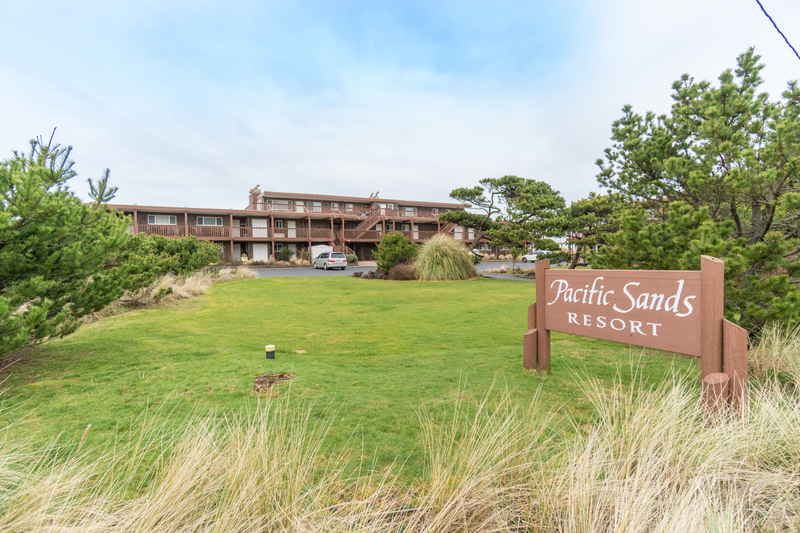 We are happy to hear that you enjoyed your stay at Pacific Sands Resort #18! We hope this means that you'll be back again soon!" "This was our third stay in Unit 18. Walking in the door feels like coming home. Wandering through Neskowin feels like visiting neighbors. Lovely place. Magnificent setting." "Awesome location, closest we've ever stayed to the Ocean. Rythmic pounding waves mesmorized us by day & lulled us to sleep at night. Perfect viewpoint with Chief Kiwanda Rock to the north and Propsal Rock to the south. Excellent beach for stretching your legs when tide is out. #18 was an awesome second floor suite. Lovely beach colored interior, all the amenities for a comfortable stay, with two decks, a wall of windows facing the ocean, two sleeping areas with separate bathrooms & cute little kitchen. We loved our stay of 4 days and hope to come back when the sun is actually out." "Hello Leslie, Thank you for your review. We are so happy to hear that you loved your stay at Pacific Sands Resort #18! We can't wait to host you again on the Oregon coast! Thank you again for your review!" "So thankful to have found this glorious gem! Everything was super clean, the view was unbelievable. We cant wait to come back. It was just the two of us, but the condo is equipped to handle more guests. We didnt try out the Murphy bed, but it looked quite comfy. It was great having a deck off of the master, too. The bed was just fine, although a king bed would be better. Thanks!! " "Hello Laylah, Thank you for your review. We are glad to see that you enjoyed your stay at Pacific Sands Resort #18. We can't wait to see you back on the Oregon coast as well!" 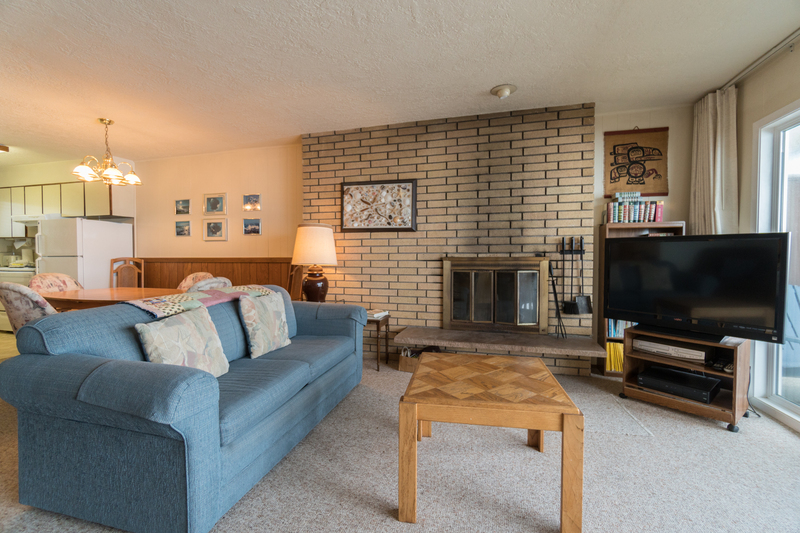 "One of our favorite rental properties! The beds are actually comfortable and once you figure out the TV there are no problems. Staff is available by phone and very helpful. It would be nice if they included 2 keys in the lock-box so I wouldn't have to worry about losing IT. Great view of course and the second floor seems safer than the first. Hope to return soon." "We came to relax and we did! #18 at Pacific Sands was just right! Great bed, and awesome view! We enjoyed meals at Neskowin's Hawk Creek Cafe and everything was easy driving distance from our place! Next time we would definitely try the Murphy Bed and put a fire in the fireplace! We'd recommend #18 to anyone! " "Hello William, Thank you for your review. We are so happy to hear that you enjoyed your stay at Pacific Sands Resort #18. We hope to see you again soon on the Oregon coast!" "Place is as advertised. Outdated décor, but clean, and an amazing beachfront location. Local manager was very helpful.Would highly recommend this rental. " "Hello David, Thank you for your review. We are happy to hear that you enjoyed your stay at Pacific Sands Resort #18. We hope to see you again soon on the Oregon coast, and thank you again for your review!" "This is our third year in a row staying at this rental wife and I were so pleased to have our daughter and grand daughter join us for a couple of nights.The weather wasn't the greatest,but we had a wonderful time.The unit is nicely furnished and the two bathrooms made it even better.Great ocean front view.Saw a whale cruise by our first AM there.This will be our annual thing to do on the Oregon coast!" "Hello Dennis, Thank you for your review. We are so happy to hear that you and your family had a wonderful and fun stay at Pacific Sands Resort #18! We can't wait to see you back soon on the Oregon coast!" "We had a great vacation. Have stayed here several times and will in the future. Please update your entry code email. Door keypad didn't work and lock box code was not included so needed to call for help." "Hello Tamara, Thank you for your review. We are glad that you had a great stay at Pacific Sands Resort #18. We are sorry to hear that you had trouble getting into the unit. We will look into this. Thank you for bringing it to our attention." "We enjoyed our getaway very much! 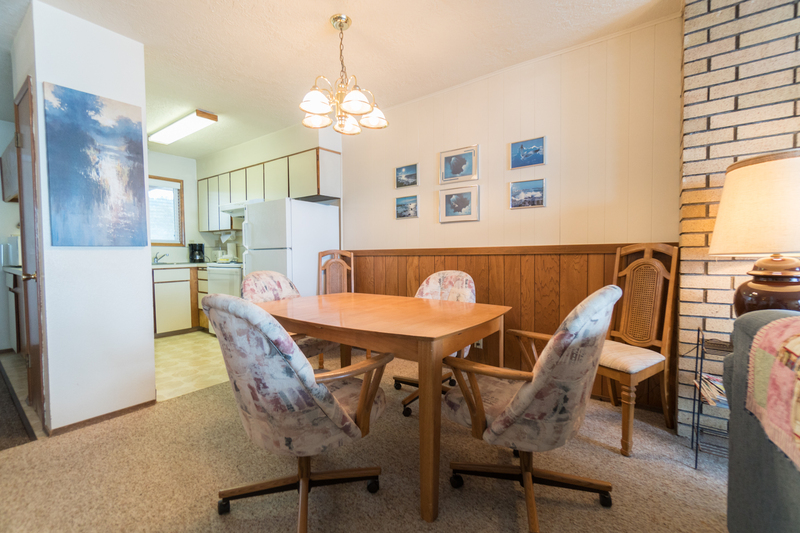 The location was perfect, the condo was very clean and had comfortable furniture. Loved that there was a deck off the bedroom too. We hope to return again and again. It was the tranquil escape we needed." "Hello Cindy, Thank you for your review. We are glad to hear that you enjoyed your stay at Pacific Sands Resort #18. It sounds like this unit was perfect for all of your needs. We look forward to having you stay with us again soon!" "This is our third time at this complex, but our first time on the second story. We wanted to experience stormy weather, but didn't want to risk having the windows boarded over, so we opted for an upper condo. The view from the balconies was even better than the ground floor. The drawback is that you have to go out the front and around instead of just walking out your back door if you want to go on the beach. This unit has a large bedroom with a very comfortable bed. It also had two nice sized bathrooms. 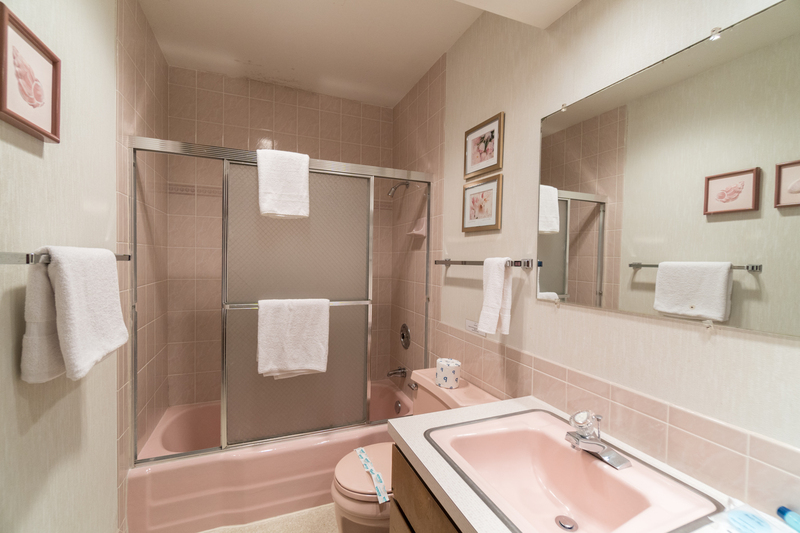 The "pink" bathroom had a very slow drain so you may want to use the "grey" one for showering. The living room had a newer t.v. so we were able to hook up our Roku and catch up on some movies in our down time. We didn't do any major cooking, as we head to Lincoln City or Pacific City for most meals. We did try the pizza from the trading post this time and really liked it. The only improvement I would suggest is more comfortable furniture in the living room. There was one recliner that was very comfortable, but the love seat (which I believe folded out) was not at all comfortable to sit and watch t.v. on. The storms that came through during our stay were fairly mild, but we still loved to stand on the balcony and watch the force of the waves. And, yes, they do shake the building and rattle the doors, which is part of the fun! We always travel with a box fan for white noise though, so it didn't keep us up at night. We really enjoyed our stay and will absolutely consider this unit when making future reservations!" "Hello Deborah, Thank you for your review. We are glad to hear that you had a good time while staying at Pacific Sands Resort #18. We hope to have you stay with us again soon in the future." "The property is in an ideal location and for the most part in excellent condition with a few exceptions. The heating was a bit of a mystery! There were three thermostats, two within a couple feet of each other. There were no visible heating vents so it was not possible to tell if heat was on or not. We suspected radiant heat but at times the unit was quite cold and we had to turn the heat to 80 to get some feeling of heat. Cold air was blowing in from around the ceiling lights in the second bathroom making it the bathroom uncomfortably cold. As well, cold air was coming in from air vent above the kitchen range making the kitchen cold. Once the outside temperature improved and the wind subsided the temperature in the unit overall improved. Additionally, the lock on the front door did not function properly and we had to call to access the key from the lock box to gain access to the unit. We tried numerous times to use the front door push button lock but it never worked the three days we were there." "Hello Rob, Thank you for your review. We are glad to see that you enjoyed your overall stay at Pacific Sands Resort #18. We are sorry to hear that you had issues with the heating system. We hope you gave us a call to let us know and have someone come out and look at it for you during your stay. We are also sorry to hear that the lock on the door was not working for you during your stay. We hope to see you back again soon on the Oregon coast, and thank you again for your review." "Our family enjoyed our stay at Pacific Sands. Condo is no frills but clean and fairly comfortable. (Living area furniture is not very comfortable with the exception of the recliner. The hide-a-bed is not comfortable either.) Very nice having the two bathrooms and the view/location is unbeatable. Take your time with the electronic lock... it is easy to get it messed up and too many tries will lock you out for a few minutes! We had no problems during our visit and the rental process was a breeze." "Hello Karen, Thank you for your review. We are glad to see that you enjoyed your stay at Pacific Sands Condo #18. We are sorry to hear about the electronic lock giving you a bit of a hard time, but we are glad you got it figured out in the end. We hope to have you stay with us again soon on the Oregon coast." "This is the second time we have rented this unit. Unit was perfect for our needs. 2 adults and an occasional visitor. Nice to have two bathrooms. Good to be on the 2nd floor and right on the ocean. Enjoyed the two decks." "Hello Mary Lou, Thank you for your review. We are so happy to hear that you enjoyed your stay at Pacific Sands Resort #18! We hope this means that you'll be back again soon on the Oregon coast!" "Found the apt very comfortable. View of surf is great. Be forewarned, stormy waves crashing on rip rap rocks will resonate through the building. Microwave display doesn't illuminate all segments but it does work. Murphy bed in living room was a comfortable surprise. Really enjoyed our stay. " "In years past, we stayed with our family many times at Pacific Sands, so it was nice to return and find Neskowin looking good and Paciific Sands looking well maintained.The room was comfortable and well equipped.Be warned that the plumbing is ancient: the kitchen sink faucet leaked and it was hard to operate the bathroom sink without splashing. When we arrived there the kitchen trash was full and I could not locate additional trash bags. There is no longer an on-site office to request items such as this. " "Hello Harry, Thank you for your review. We are glad to hear that you enjoyed your stay at Pacific Sands Resort #18. As for the trash left in the kitchen, we are sorry to hear about this oversight. We hope that this did not detract from your overall stay too much. We hope to see you again soon on the Oregon coast. Thank you again for your review." We would stay here again without hesitation! "This property has a great location that is quiet and the closest unit to the ocean with a fantastic view. The property itself is very comfortable with plenty of room. It is a bit dated but who spends that much time in their room anyway. Overall, we would stay here again without hesitation! " "Location is perfect. Grounds were not up to par (the grass outside condos was dead). Pacific Sands is showing it's age but we love being right by the beach." "We stayed 5 nights in #18.. The unit had everything we needed to make our stay comfortable. We enjoyed the 70s decor! The oceanfront view was absolutely perfect. There were only 3 downsides to the condo: the keypad on the front door is wonky and sometimes the zero button would stick. It took us up to 4 tries at times trying to enter the code to gain access to the condo. That's really annoying after awhile but not a deal breaker for us. The second issue was the heat. We were able to turn the thermostat in the living room off but we could still feel heat coming from the area by the recliner. We tried keeping the sliding door cracked at night but we still woke up sweating a bit which was really uncomfortable. That needs to get fixed. Finally, the couch really is uncomfortable and the throw pillows were stained quite a bit. We hardly sat on the couch since it hurt our backs. Seems like it would be worth investing in an updated couch. We really did enjoy the oceanfront view, but with these couple of issues we decided to try another place before coming back to this unit. The biggest issue for us was not being able to get the heat off. The keypad and the couch were things we can deal with on their own. The location, beach access and the sound of waves was awesome!" "Hello Niklaus, Thank you for your review. We are glad to hear that you enjoyed your overall stay at Pacific Sands Resort #18. We are sorry that you had a few problems during your stay though. We hope that you were able to contact our office staff and have maintenance sent out to the unit to look at these things for you an try and get them fixed. We are available 24/7 with our after hours service, and we would have been more than happy to assist with anything you might have needed. We hope to have you back again soon on the Oregon coast. Thank you again for your review." "It was unfortunate that we were not told before our stay, that all the units on the entire lower floor were being remodeled due to storm damage. We arrived to construction noise in the unit directly below us. This was not the peaceful retreat we had been expecting. I called to see if we could move to another unit, but nothing was available. We were offered a place in Lincoln City, which we declined. We have been coming to Neskowin for fifty years, and that is where we wanted to spend our 50th wedding anniversary. The unit was adequate but didn't feel inviting. I realize that decor is a personal choice, but we found the bedroom dark, and the lighting very poor. As others have mentioned, the couch is uncomfortable, and cushions stained. The ceiling above the tub in the pink bathroom looked moldy. I'm not sure it was mold, but it definitely needs attention. We didn't feel comfortable here, and would not return.The one positive note involves the gentleman who serves as the HOA onsite manager. He was very helpful, and we enjoyed his bird sanctuary." "We first noticed that the unit was dirty, dirty floors, furnishings by smell and appearance.There was a dog pen and load barking dogs most of our stay directly in unit below us. "